For our patients at Coleman & Coleman Advanced Dentistry who seek a permanent solution to shifting dentures and messy adhesives, we offer an alternative designed to function with the strength of normal teeth – and blend seamlessly with your natural teeth. Our experienced dentists, Dr. Coleman and Dr. John, use dental implants to support the stability of a removable denture, allowing you to eat and speak with greater ease. Implant supported dentures substantially reduce movement along the gums without the need for pastes and adhesives, allowing you to chew and enjoy foods that most people with traditional dentures tend to avoid. The support of the dental implants also helps protect your gums while simultaneously reducing bone loss. 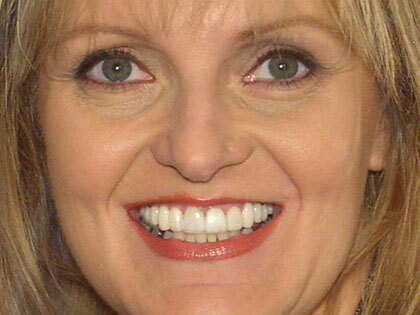 Most importantly, implant supported dentures look and feel more like natural teeth. The ideal candidates for implant supported dentures are men and women with missing teeth seeking an alternative to traditional dentures or dental bridges. 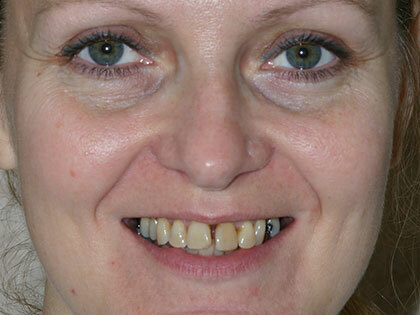 They must also have adequate jawbone density to securely support a dental implant. Our cosmetic dentists will perform an examination during the consultation process to determine if implant supported dentures are the best option for your individual needs. Our patients often find that implant supported dentures provide a life-changing alternative to the inconveniences of traditional dentures. They often experience a boost in self-confidence after the procedure, and ultimately become even more proud of their smile. 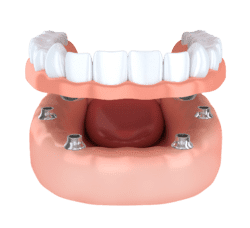 Another innovative option, All-on-4 or more is a type of implant denture that uses a minimum of four dental implants to secure a dental appliance for either the upper or lower arch. With precise planning and a sufficient amount of jawbone density, All-on-4 or more can provide beautiful, comfortable results with a very fast turnaround. Often referred to as “Teeth in a Day,” this method allows our experienced dentists to place the implants and provide the denture on the same day. There will be very limited restrictions for use initially, as the implants integrate with the jawbone, after which point you should be able to enjoy all the foods you may have had to give up with traditional dentures. As with implant supported dentures and a full set of dental implants, All-on-4 or more can provide greater smile confidence and a tremendous improvement in comfort over traditional dentures. During your initial consultation, we can help you determine if All-on-4 or more is right for your needs and lifestyle. If you would like to learn more about how implant supported dentures can replace missing teeth, or to schedule a consultation, please contact us today.